Lochend’s Aston Brown was stopped in round four last night as he suffered defeat to Oleksandr Khyzhniak in the British Lionhearts’ loss to Ukraine Otamans 3-2 on matchday two of the World Series of Boxing group stages in Kiev. 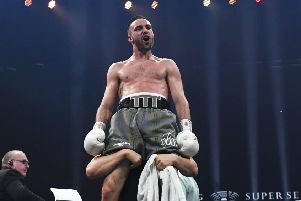 It was Glasgow-born Brown’s debut bout at light heavyweight after recently moving up weight division, the former middleweight boxer finding it tough going in the Ukrainian capital against a strong home opponent. The 23-year-old, who missed out on a place at last summer’s Commonwealth Games, showed a lot of promise within the ring but struggled to find any sort of rhythm against a powerful Khyzhniak. Super heavyweight’s Joe Joyce and Ekow Essuman of the welterweight division were victorious for the British outfit. The Lionhearts are next in action on match day three when they travel to face Morocco Atlas Lions next Friday.